Jacquemart, Albert. Histoire du mobilier. Paris: Librairie Hachette, 1876. Provenance: Morris. — Richard Bennett. — Sotheby 1898, lot 453 (sold to Henry Wellcome for 13s.). — Henry Wellcome. — Unlocated. Reference: MS catalogue (2), no. 504. Giraud, Jean-Baptiste. Meubles en bois sculpté ayant figuré à l’exposition rétrospective de Lyon 1877. Lyon: privately printed, 1880. Provenance: Morris. — Richard Bennett. — Sotheby 1898, lot 550 (sold to Henry Wellcome for £2 12s.). — Henry Wellcome. — Unlocated. Reference: MS catalogue (2), no. 350. Sanders, William Bliss. 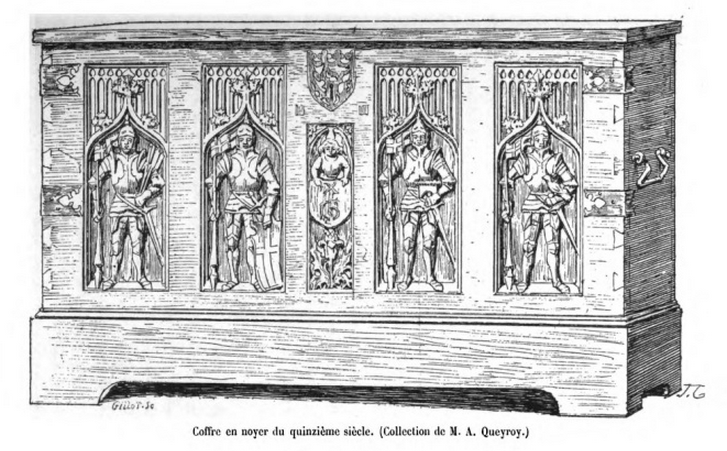 Examples of carved oak woodwork in the houses and and furniture of the 16th and 17th centuries. London: Bernard Quaritch, 1883. Provenance: Morris. — Richard Bennett. — Sotheby 1898, lot 997 (sold to Henry Wellcome for £2 8s.). — Henry Wellcome. — Unlocated. Reference: MS catalogue (2), no. 338. Ancient and modern furniture and woodwork in the South Kensington Museum. London: published for the Science and Art Department of the Committee of Council on Education by Chapman and Hall, 1874. 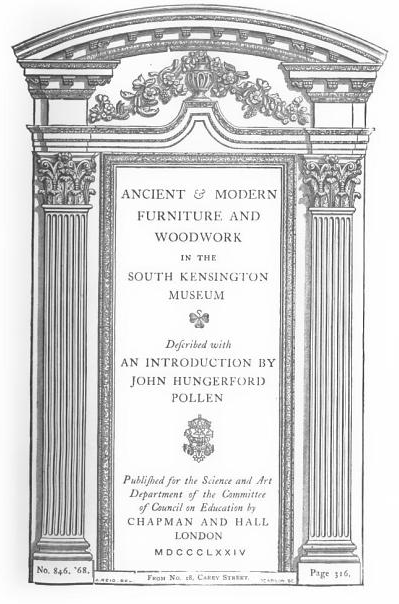 With an introduction by John Hungerford Pollen.